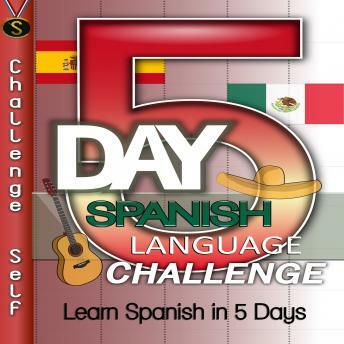 Listen to "5-Day Spanish Language Challenge" on your iOS and Android device. *You MUST download the accompanying reference material PDF in order to go through the audiobook. - You want to speak the second most popular language in the world. - You want to be able to visit the different Spanish-speaking countries. - You want to know how to better communicate with Spanish speakers. - You want to have the chance to further advance your career in the USA. - You want to have the easiest and fastest way to study Spanish for beginners. Spanish is one of the most widely spoken languages in the United States and in many countries. In fact, it has the second largest number of speakers on this planet-right after Chinese. Now many folks have taken some kind of foreign language when they are in school, but if you didn't get the opportunity to study Spanish-it's not too late. Travel - If you travel to a Spanish-speaking country, having a rudimentary idea of the language will help you get around and get along with those who live there. You will know where to go and look less like a tourist. When you are lost or need information, you can ask anyone in their own language and understand them. Business - If you have a business, knowing how to speak multiple languages can increase your bottom line. Sometimes you will have a client who only speaks Spanish, and knowing Spanish will help you be able to communicate and connect with them. Job Opportunity - When you are looking for a job, being bilingual can help you tremendously with standing out and having a better chance of being hired. It shows potential employers that extra value you have to offer for their expansible customer base. So, if you are looking for a simple way to learn Spanish in only a few days, our '5-Day Spanish Language Challenge' will set you on your path to success!